The growth of personalized medicine and new insights into the genetic causes of disease have led to a bottleneck in sample preparation in many clinical genomics labs. We offer a broad range of genomic solutions, from automation of nucleic acid purification, quantification and normalization to reaction set-up and sample preparation for PCR-based testing and next generation sequencing. A simple and intuitive touchscreen interface, with ready-to-use protocols, allows users in clinical laboratories to produce consistent, repeatable and cost-effective results. High quality nucleic acids are essential for precise and consistent results in a variety of clinical genomics analyses, in areas such as infectious diseases, oncology, human genetics and personalized medicine. 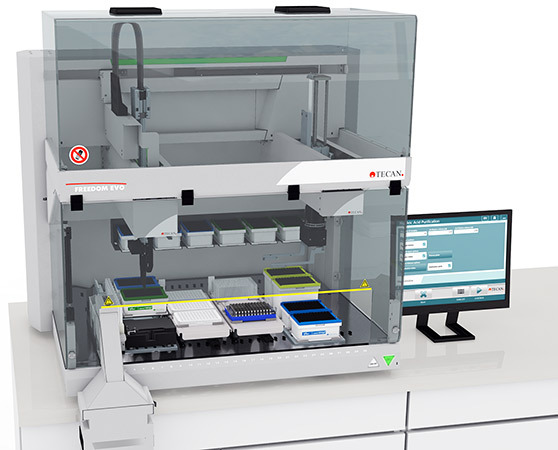 Based on the Freedom EVO workstation, we offer building-block modularity and reliable automated extraction of DNA, RNA and circulating cell-free DNA (ccfDNA) from blood, plasma and other body fluids – as well as fresh and FFPE tissue samples – with optional integration of DNA quantification and normalization. Flexible automation to process one to 96 samples with an eight-channel arm, or very fast purification with a 96-channel head. We offer an array of validated protocols and platform configurations to suit your needs. We also provide a uniquely efficient and reliable system for isolating genomic DNA from large volumes (1-10 ml) of blood, typically drawn into a standard 10 ml Vacutainer® tube. The combination of the Freedom EVO with Promega’s HSM instrument and ReliaPrep™ Large Volume HT gDNA Isolation System allows automated recovery of pure gDNA from up to 32 blood samples (each up to 10 ml) in a very short time. For even faster processing, the Fluent® Gx platform provides scalable throughput to match your application needs, with the flexibility to switch between random access samples, 96-well plates and 384-well formats as required. Next generation sequencing (NGS) has become a decisive tool in diagnostic, therapeutic monitoring and prognostic applications for oncology, human genetics and infectious diseases testing. Sample preparation is critical to the reliability of the NGS workflow. Automated sample preparation allows more samples to be processed in parallel, and increases the reproducibility of libraries while minimizing errors. The Freedom EVO NGS workstation is equipped with innovative air displacement pipetting technology. This flexible system allows you to process one to 96 samples, so you only have to run what you need, saving on reagents. The touchscreen interface is so simple that you can get started straight away, quickly setting up your runs with complete confidence in your workflow. The Freedom EVO NGS workstation supports a variety of NGS library prep protocols. Additional protocols can be implemented upon request at any time. System performance is checked using 'water testing' or mock solutions during installation. User training ensures you up and running as quickly as possible. PCR techniques, including advanced variants, have led to valuable developments across several areas of clinical diagnostics, such as allowing the direct detection of microbial pathogens in clinical specimens. The wide range of PCR set-ups required for different downstream analysis methods, combined with the high throughput of samples in the laboratory, demand a flexible, reliable and user-friendly automated solution. Automate more of your clinical genomics workflow – including reaction set-up for end-point PCR, qPCR, hybridization, Sanger and next generation sequencing – with optional integration of dedicated On Deck Thermal Cycler (ODTC®) from INHECO. PCR cycling methods can be set up with ODTC's script editor software, then selected for a specific run using Freedom EVOware®. After the run starts, Freedom EVOware drives the opening and closing of the ODTC and starts the PCR method for up to 10 integrated ODTC devices. Users can quickly and easily optimize 96- and 384-well PCR plate layouts to meet specific workflow needs, allowing up to 96 master mixes and multiple PCR plates per run, with their own controls and dilution curves. The intuitive TouchTools interface helps to reduce training time and costs for diagnostic laboratories. The driving force behind every Freedom EVO application is Freedom EVOware, which lets you implement methods with an innovative, drag-and-drop graphical user interface (GUI). This is complemented by built-in sample tracking, audit trails and user access controls to ensure process integrity. Intuitive, step-by-step procedures, from worktable preparation and starting a run to routine maintenance. User-defined scripts and easily customizable procedures allow rapid adaptation to different workloads and enable the flexible set-up of multiple applications. TouchTools is available in English, French, German and Chinese. The TouchTools PCR wizard is an easy-to-use Freedom EVOware add-on offering straightforward automation of PCR reaction set-up. Sample-based pipetting allows the user to specify different tests for different samples, with graphically defined plate maps and a wide range of dilution options. Enhanced process security with full traceability for samples and pipetting actions, including concise volume and concentration tracking, audit trails, and printed and electronic records. Robust purification of high quality gDNA from human whole blood and saliva using the ReliaPrep™ 96 gDNA Miniprep HT System. Reliable extraction of gDNA from blood samples with high yield and purity using the NucleoSpin® 96 Blood kit on a Freedom EVO® platform. Reliable purification of PCR products with high yield and purity using the MACHEREY-NAGEL NucleoSpin® 96 PCR Clean-up kit on a Freedom EVO® platform. Reliable, high yield extraction of exceptional purity genomic DNA from blood samples, using the NucleoMag® Blood 200 μL kit on a Freedom EVO® platform. Researchers at ISPRA have been trialing the TouchTools PCR Wizard for the Freedom EVO® PCR workstation to simplify complex genetic testing workflows. This software enables rapid selection and walkaway set-up of pre-PCR protocols suitable for a wide range of downstream analytical techniques. The Leiden University Medical Center has integrated the Freedom EVO® NGS workstation into its molecular diagnostic testing and clinical research workflows. Taking advantage of this preconfigured solution, the center was quickly able to commission the platform for routine testing, while still having the flexibility to develop new protocols and conduct research studies. The Molecular Biology Department at Colombia’s Laboratorio Clinico Medico Colcan is using a Freedom EVO® 150 liquid handling platform to automate its nucleic acid extraction and real-time PCR protocols, offering increased flexibility and helping to improve sample throughput.